WBC TEAM TOURNAMENT GETS AN EARLY START: The usually late arriving	entries for the Team Tournament have gotten a rousing start with 16	teams already entered in the lists and comedically armed with official	team logos courtesy of our favorite photoshop graffiti artists. Will we break the WBC record of 103 teams? Who will win the bracket	busting prediction contest this year? Can anybody stop Nest of Spies	from taking their fourth title? The Happy Handicapper awaits your	pleasure. Check the upcoming July newsletter for this year's odds. AUCTION REGISTRATION SOLD OUT: Slots in the WBC Auction have sold out	in record time. Do NOT submit any other items for a place in the	Auction. A list of the items in the auction will be posted around July	1. Pre-registration remains open for the Auction Store and is	mandatory to have your items included. The drill is much the same but	the site will be different as we move the auction from the Lancaster	Showroom to Lampeter Hall. 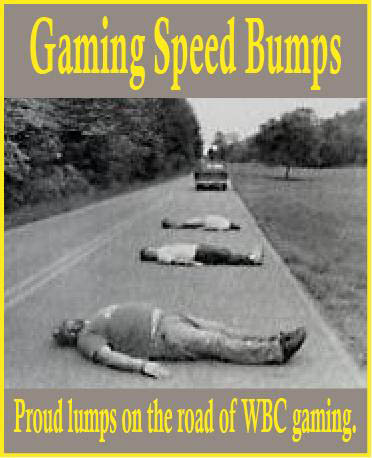 WBC WORKERS NEEDED: We're looking for a few gamers who'd like to "work" their way through WBC in exchange for free lodging, admission, and some spending money. Though the work is hardly arduous, the hours are long. If interested, contact conventiondirector@boardgamers.org. SHOWCASE SCHEDULE ANNOUNCED: Tom McCorry has released the schedule for his crew of 'splainers in the Showcase Sampler. Eight new games will be taught and played in the Lancaster Showroom during the Tuesday auction lull in tournament play with two being introduced every two hours starting at 9 AM. The list includes Luna, Innovation, Airlines Europe, Earth Reborn, Letters from White Chapel, Sid Meier's Civilization: the Board Game (naturally), 20th Century and Rails of New England. GROGNARDS RETURN: WBC is naturally the place to hear vicarious war stories from those who have been through the cardboard wars since the birth of wargames. One such veteran making his return is Joe Angiolillo who has seen it all. He will be spilling his adventures in a series of three seminars that will chronicle the birth and development of the best selling wargame of all time (Axis & Allies) in addition to his other exploits with such hits as Ace of Aces and numerous SPI games. Not to be outdone, grizzled Lt Stahler himself will return from his place on your shelf in that Squad Leader box to make an appearance on Sunday morning to autograph L2's new release of his Breakout Normandy design. 2011 WBC EVENT PREVIEWS AVAILABLE: The individual event previews and schedule for all WBC tournaments are now posted at http://www.boardgamers.org/yearbkex/ as only WBC does them. View the details of your favorite events and then plan your schedule using Steve Okonski's Personal Scheduler at http://www.boardgamers.org/wbc/sviewer/. You can find additional scheduling aids by Steve at http://www.boardgamers.org/wbc/schedule.htm—including both color and B&W pocket schedules and an all-in-one version for the ultimate in planning your week at WBC. A spreadsheet and ical version of the schedule is also posted there and will be joined by the convention program shortly. 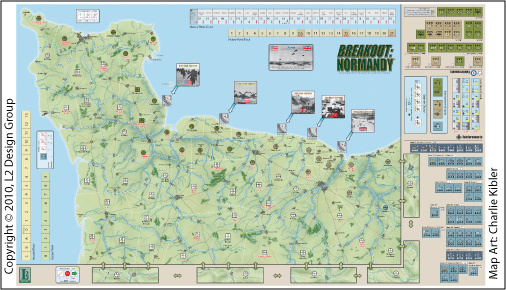 DELUXE BREAKOUT NORMANDY DEBUT: WBC isn't often the site of the initial release of new games—such honors usually going to larger commercial venues. However, we had some leverage in this case so for once WBC gets to debut a new title. The L2 2nd edition of BKN seeks to clarify and simplify what has become recognized in most quarters as a classic design while improving play balance based on virtually thousands of games played. Improved graphics and enlarged pieces complete the package. L2's suggested retail price is $75. Shipping charges will more than eat up any direct mail discounts, but those picking up their copy at WBC will get the bargain price of $60. The catch? Since he's bringing them from Canada, Art needs to know how many to bring. So, to get this price you must pre-order at http://L2DesignGroup.com/BN/WBC-Order.html by July 15. Those waiting to buy at the show, run the risk of the game being sold out. YEARBOOK & FREEBIES DEADLINE: The chance for free souvenir shirts, hats and yearbooks is long passed—having expired in January for Sustaining members and in May for Tribunes. Those wanting these items need to order them before July 23 for delivery at WBC. The traditional silkscreened t-shirts are being offered for what is probably the last time this year, so order them now or never. 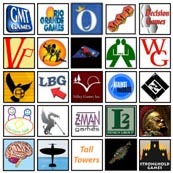 Qualifying members of record by the required deadline were mailed their Yearbook on May 6, but you can still view the annual summary of the BPA year at http://www.boardgamers.org/yearbook10/print/. Programs with the 2011 schedule will be available later, but only on-line and at WBC. WBC PUBLICITY: Those willing to lend a hand by spreading the word for WBC will find the usual assortment of aids available for download on our publicity page. Posting a copy at your local club or gamestore would be much appreciated. Available materials include both a low and high resolution poster, flyer, and postcard. 2011 ELECTION ENDANGERED: Voting has been very light in the election thus far—too light! If we don't get the required minimum % of participation, another election will have to be held at greater expense that will be passed on to the membership. Take a moment to vote now! A printable ballot for the 2011 election is available at http://www.boardgamers.org/election.htm. Jonathan Lockwood is again making a bid for a Board seat against the three incumbents; Ken Gutermuth, Kaarin Engelmann and Bruce Monnin. Cast your vote sometime before the July 15 deadline. While ballots can be cast by mail or email also, true on-line voting for the ultimate in convenience is available at http://www.boardgamers.org/forms/BoardBallot.shtml. WBC 2011 PRE-REGISTRATION NOW OPEN: The registration form for the 2011 World Boardgaming Championships is now available. Current Sustaining/Tribune level members need not register except to enter a team in the Team Tournament or order souvenir hats, shirts, or Yearbooks or purchase Pre-Con admission (non-Tribune members only). Pre-registration is encouraged as it saves $10 per person over at-the-door rates. WBC LOGISTICS: So, have you registered yet? If you forgot whether you renewed your membership, you can check your status. You will also be able to look for roommates, team members, rides, non-gaming excursions and Open Gaming opportunities on this page by sending your request to acd@boardgamers.org. All we ask is that you promptly notify us to remove your advertisement when your needs have been met so as not to waste others' time. WBC VENDORS: The WBC Vendor's Room is again a sellout, assuring attendees a wide selection of new and hard-to-find games to purchase in 2011. 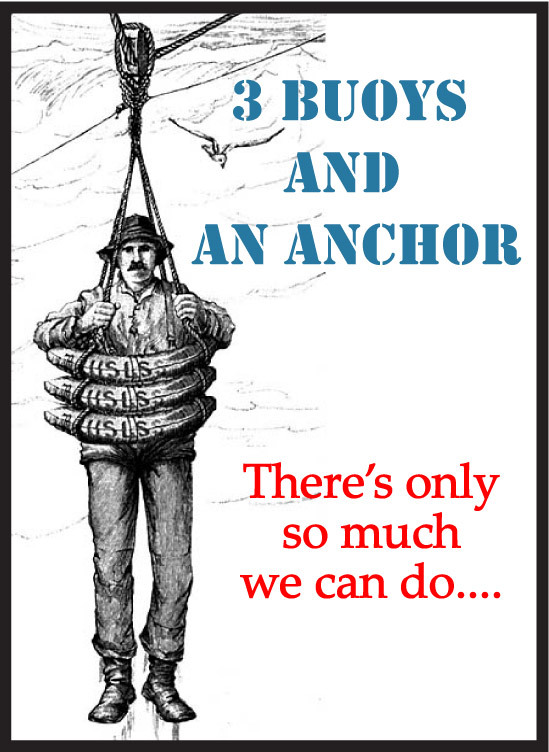 See the vendor links on our home page for a complete list. If the Vendor's Room is an important part of your convention experience, be sure to visit during the last three days of the conference because it does not open until Friday, Aug. 5. GAME LIBRARY: The BPA Game Library continues to grow with additions from a wide variety of publishers—including some unable to attend our Vendor's Room. But you can still examine their products at your leisure. Check out the new additions. This year the Library will be available from Monday through Saturday in the 13,000 sq ft tiered dinner theatre of the Lancaster Showroom which will be open for the entire week. This expansion has been made possible by the generous sponsorship of Queen Games. USSERY WINS VICTORY IN THE PACIFIC: The sixth BPA PBeM tournament started with 28 hopefuls in 2009... By October 2010 we were down to two—the 4th and 5th seed, Michael Ussery and Jim Eliason respectively. Both began the tournament with nearly identical AREA ratings and played as the favorite in all but one round. The contest was about as even as possible but Mike's Japanese could not be denied. Following in the laurels parade were Michael Day, Nick Markevich, Robert Drozd, and Bryan Eshleman. More details and updated laurels can be found at http://www.boardgamers.org/yearbook/vippge.htm. Read about the entire tournament at http://www.gameaholics.com/vitp_bpa/vitp_bpa_single_elim_09.htm. Plan ahead to join the new tournament which begins this Sept. 15 by contacting john@gameaholics.com. Get the details at http://www.gameaholics.com/vitp_format/vitp_bpa_format.htm. PACHECO TAKES GETTYSBURG: Mike Pacheco has won the 3rd Gettysburg '88	BPA PBEM Championship. Mike swept the Yankees from the field five	times (almost as impressive as the Red Sox) and defeated the pride of Austin, TX, Bill Thomson, in the final match. Mike, the #8 seed, bid 5.5 to command the Rebels against	#6 seed Thomson. The South held only a slight edge as July 3 dawned,	but pulled steadily away until the North resigned on turn 21. 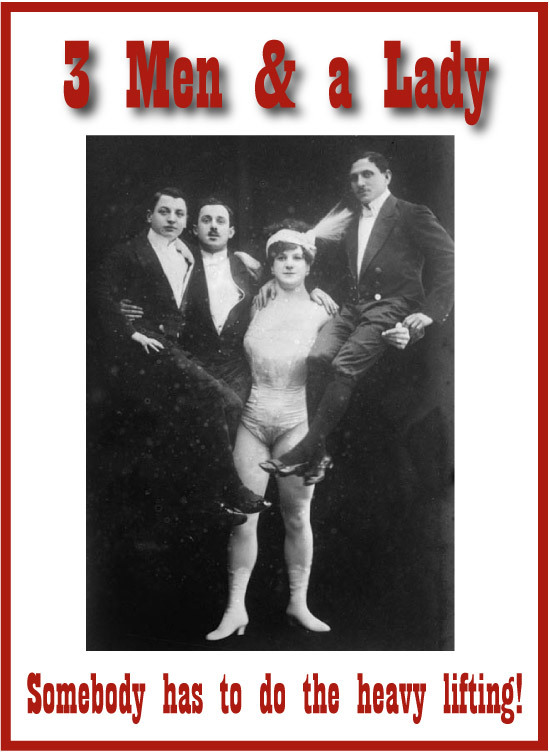 The	other laurelists were Dan Overland of Flint, MI (3-1), Ed Menzel	(Fullerton, CA (3-1), Dennis Nicholson (Pawling, NY (2-1), and Tom	Gregorio (Blue Bell, PA (2-1) in that order. His 3rd place finish	marked Dan Overland as the Rookie of the Year. Mike Pacheco's 5-0	tally as the Grey earned him Best Confederate honors, and Dan's 3-1	slate as the Blue took top Union honors. The CSA took 22 tournament	contests to the USA's 11, but went only 4-3 in the last three rounds	as the competition stiffened. More details and updated laurel totals	are available at http://www.boardgamers.org/yearbook/gbgpge.htm. BATTLES OF THE AMERICAN REVOLUTION: 22 players began the tournament	that will be contested over four different Revolutionary War	engagements in as many swiss rounds. Round 1 featured Eutaw Springs	with the Americans winning six of 11 games. Round 2 saw the event	move to the turning point of the Revolution - Saratoga. The game did	not follow history as the British won four of the seven games played. We are finishing up Round 3 at Brandywine with five of the six games	finished and the British holding a 3:2 edge. Round 4 will feature	Monmouth's scenario the "Holding Action". Players may still join for	this game to practice for this summer's WBC event at http://www.ohiovalleygamers.org/boarpbem.html. The undefeated players to this point are Bill Byrne, Chris Easter	and James Tracy. SPEED CIRCUIT: Our first PBeM racing tournament is being planned for	a Sept. 8 start using the special WBC rules and charts. 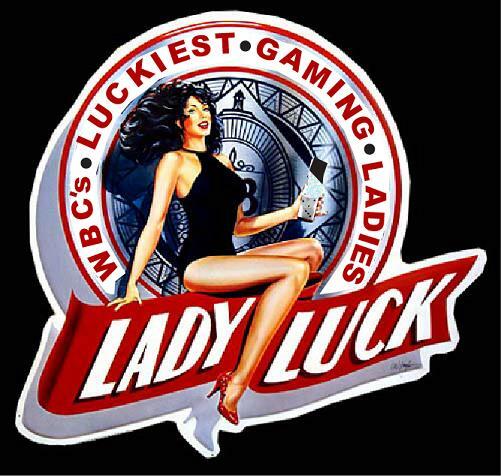 Moves	are expected every 36 hours and dice will be rolled using the on-site	dice server for the event at http://lucidphoenix.com/sc/wbce/. Check	it out and sign up by contacting GM Robert Rund at rbrund@verizon.net or talk to him or Doug Schulz at the WBC tournament.